There are many reasons we pick up a particular book. Reasons ranging from nice cover, to good reviews, we have all been there done that. One of the most pivotal reasons buying the book is – the author. After having read Ravi Subramanian’s all previous book, I was eagerly waiting for this one, and I was not disappointed. 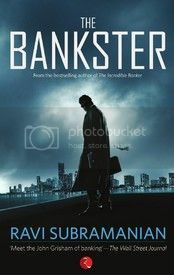 Like someone said, John Grisham is for legal, Robin cook is for medicine and Ravi is for banking. After consistently doling out blockbusters over blockbusters, Ravi truly deserves the accolade. The story of the book is like a jig saw puzzle taking you places. Four parallel stories running and you know there is a link but are just not able to figure out. How could possibly killing an elephant in some small village in Kerala be linked to a global scam in a multinational bank? This and many other thoughts keep hounding your brain till the very end of the book when everything starts making sense. The character, Karan Panjabi, which has been introduced in Ravi’s previous books, again makes an entry as the main lead. He is a banker turned journalist and this time he is in it for personal reasons. The story revolves around continuous murders that occur in the bank, and Karan Panjabi steps in to investigate. Little does he realize that this is much bigger than anybody could think? Ranging from the Kerala protests against the nuclear plant to international conspiracies, everything is beautifully linked in this maze of money. From Angola where a CIA agent gets diamonds in exchange of supplying arms to rebels and getting paid in diamonds, in exchange to Kerala where an elderly man is leading a protest against the nuclear plant. From the head office of the Greater Boston global bank in Mumbai to Vienna where an employee of the bank is holidaying, Ravi manages an interesting ride. A slight drawback of the book is the overuse of Hindi, which was sure added to bring in nativeness and authencity in the feel, but loses the readability in the process. Also, the character building could have been worked upon a little more (to an already hefty book!) to relate better. Overall, I would go with a 7.5/10 for the book.